FILE- Ukrainian soldiers perform weapons exercise at training ground outside Lviv, western Ukraine, Feb. 5, 2015. U.S. Defense Secretary Jim Mattis said Thursday during a visit to Ukraine that the Trump administration was "actively reviewing" whether to provide lethal defensive weapons to the war-torn country. When asked whether Russia might see such a move as a threat, Mattis responded, "Defensive weapons are not provocative unless you're an aggressor." The previous U.S. administration held the view that sales of defensive lethal weapons to Ukraine would unnecessarily provoke Russia, but Trump administration officials have reopened consideration of the previously rejected plan. "The morality of doing something that would have a counterproductive result struck [President Barack] Obama as a mistake. That was his interpretation. We don't know where President [Donald] Trump's interpretation will wind up," Michael O'Hanlon, a senior defense fellow at the Brookings Institution policy research group in Washington, told VOA. Mattis, who reaffirmed the U.S. commitment to Ukraine while in Kyiv, said Washington does not accept Russia's 2014 annexation of Crimea. He added that Russia was "seeking to redraw international borders by force," and that U.S. sanctions against Russia would therefore remain in place until the government in Moscow changed its behavior. 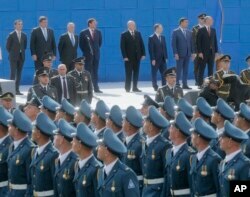 U.S. Defense Secretary James Mattis, third left, and Ukrainian officials watch a military parade to celebrate Independence Day in Kyiv, Ukraine, Aug. 24, 2017. The U.S. defense secretary visited the country a day before an expected cease-fire in eastern Ukraine that will coincide with the start of the new school year. However, O'Hanlon cautioned that the cease-fire was most likely a tactical and self-serving move by the Russians. "I don't believe it will be likely to endure, but it's probably a negotiating ploy to try to get the United States and other countries and actors to see things more in favor of avoiding any escalation and avoiding giving weaponry to the Ukrainians," O'Hanlon said. Mattis said Russia was not "adhering to the letter, much less the spirit," of commitments in the Minsk Agreement to resolve the conflict in eastern Ukraine, as well as other deals the country has endorsed. "The U.S. and our allies will continue to press Russia to honor its Minsk commitments, and our sanctions will remain in place until Moscow reverses the actions that triggered them," Mattis said. "As President Trump has made clear, the United States remains committed to diplomatic efforts to resolve the conflict in eastern Ukraine."